For some reason, the Blesbok was never on the list of my most sought after trophies in Africa. I really can not give a reason. Upon close inspection, the Blesbok is a beautiful antelope with it's white face, symmetrical horns and purple-black body. Perhaps the strikingly beautiful and common Springbok had enamored itself to me, delegating the Blesbok to a less sought after position among the hierarchy of trophies available. After my hunt for an illusive Blesbok on Uitspan Ranch in the Kalahari of Namibia, I am hereafter treating the Blesbok with the utmost respect and reverence. It will now be one of my most prized trophies when I hunt plains game in Southern Africa. 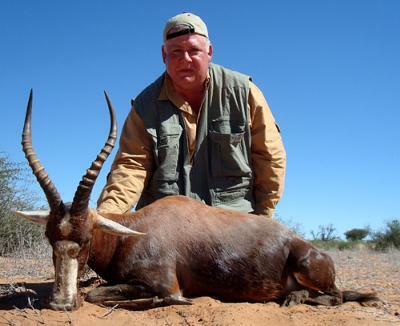 In 2008 I told Michael Duvenhage of Uitspan Ranch that I wanted to hunt a Blesbok. When I came to the Kalahari in May of 2009 Michael said that he knew of an old Blesbok with exceptional horns that had been kicked out of the main herd by more aggressive breeding rams. He told me that Blesbok are very territorial and quite aggressive; always looking for a fight. He told me that the Blesbok often fight to the death and are known to fight Hartebeest and Wildebeest that are near the breeding ewes. He told me a story of a Blesbok ram that attacked and killed a Red Hartebeest bull. The Blesbok split the Hartbeest's body cavity and impaled it's innards onto it's horns. The Blesbok ran around with Hartebeest innards on it's horns. That kind of behavior demands respect from man and beast. The Blesbok gets it's name from the Afrikaans word for blaze referring to the white markings on it's face. I also heard that the Blesbok is sometimes afflicted with a nasal parasite that causes the animal to bob it's head up and down. The Blesbok looks like it is bowing it's head in prayer. Michael, his brother-in-law Neil, and I went looking for the big Blesbok. We spotted a few lesser rams. We came to a hilly portion of the Kalahari. On the sides of the hill were three Blesbok; one was the large ram that we had been looking for. I often wonder how Professional Hunters can judge an animal in the field. It must take a lot of game viewing to become so proficient at the craft of judging animals in the field. We got out of the bakkie and attempted a stalk. Michael had forgotten the shooting sticks back at camp. He manufactured a shooting stick from a piece of Camelthorn Acacia. I practiced placing my rifle in the V of the shooting stick which was trimmed for me to use in a kneeling position. We set off after the three Blesbok. We slowly climbed the hill where the rams had last been seen. It was quite easy walking in the soft red sand. The sun was getting hotter. and set up the sticks for me. The three rams were about 100 yards away but hidden in dense grass. The rams sensed us and ran down the hill across the grass covered sand at top speed. We followed them for about a mile. We were in some Acacia trees. We spotted the rams again at 150 yards. I got down on my knees and placed the rifle in the V of the shooting stick. I took careful aim at the ram that Michael told me to shoot. My shot missed. I had shot high. The rams ran off and we followed them again for about 1000 yards. The Blesbok rams stopped and offered a shot. I placed my rifle on the branch of a tree and placed the large ram in the crosshairs of my scope. The branch broke and the muzzle end of my rifle went right into the Kalahari sand. I told Michael that my rifle's bore was full of sand. Meanwhile, the Blesbok just stood there looking at us. There was nothing else to do but go back to camp and clean the rifle. At camp we had lunch and Michael cleaned and oiled my .300 Win Mag . I was now ready for Blesbok. We got back to the place where we had last seen the Blesbok. Michael and I were on top of the bakkie. Neil drove. The Blesbok rams had been alerted to us by the morning's activity. We could not get close. These animals can run all day like the wind. They ran all day. We did not get close enough for another shot. The sun was beginning to set. Michael said we should leave the Blesbok to enable them to relax for the next day's hunt. Tomorrow morning we would bring Hendrik Sr. who is a master in locating animals. The next morning, we quickly spotted the three Blesbok rams. Once again, the chase was on. These animals can run. We spent about an hour trying to get close for a shot. In the distance we could see the Blesbok running with their dainty hoofs and large chest. We came to a large grassy area. Neil spotted the three Blesbok in the grass. They were actually standing still; they probably thought that they were hidden from us. I placed the crosshairs of my scope on the Blesbok to the left and slowly squeezed the trigger. It was an 180 yard shot. The Blesbok faltered and stumbled. He was down. I was relieved and put my arm around Michael. I shook Neil's hand. I was greatly relieved. Neil said "It is over, Steve." I said that I needed to recover from a large build-up of tension. We went to the Blesbok to take pictures and measure it's horns. The horns measured 16.5 inches; Rowland-Ward and Namibian gold. The body had a beautiful purple color. I thought it was the most beautiful animal that I had ever seen. I will never again under-estimate the Blesbok! That night, Tienie made a fantastic Blesbok Stroganoff. This is the kind of story you only see in magazines. Very nicely done. I enjoyed the trials and tribulations of hunting such an agressive and fast animal. I even liked that you went back the second day to hunt him. THE THIRD SHOT IS ALWAYS THE BEST. I COULD FEEL THE TENSION ALSO, ONE SHOT AWAY, A SECOND ATTEMPT, HAVING TO WAIT UNTIL THE NEXT DAY WITH THE PROFESSIONAL HUNTER BY YOUR SIDE. THE BLESBOK WAS YOUR DESTINY, DARE I SAY "DONT COME HOME WITHOUT IT". EXCELLENT HUNT. A WORTHY ADVOSARY THAT CERTAINLY MADE FOR A THRILLING SHOT. MAGNIFICENT MARKINGS,GREAT HORNS AND A WELL TRAVELED HUNT. KEEP UP THE GOOD WORK AND ONE DAY WE WILL BE HIRING YOU AS THE PROFESSIONAL HUNTER. The Blesbok is a wonderful trophy. I am glad that you were successeful in your hunt.